The cast of The Avengers should watch their backs: dancer, impressionist, Shakespeare-lover, and velociraptor imitator Tom Hiddleston may be coming for their roles. 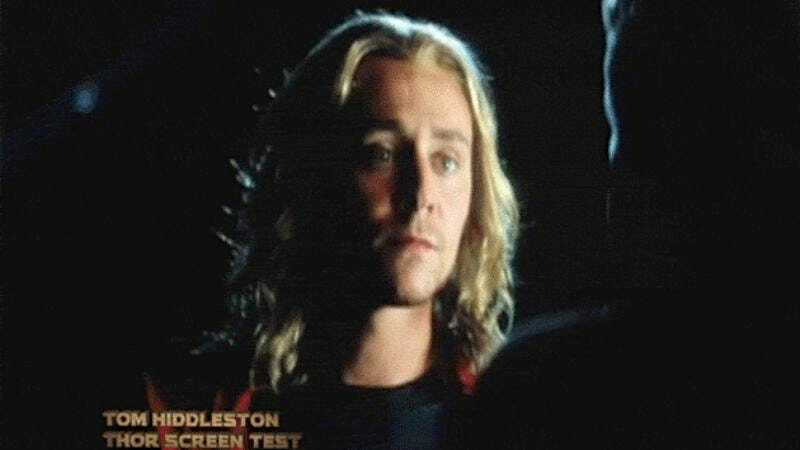 A behind-the-scenes video on the Thor: The Dark World DVD reveals that before being cast as Loki, Hiddleston originally auditioned for the role of Thor. And the two very brief shots of the shirtless actor swinging Thor’s hammer (not a euphemism) have no doubt spawned a thousand GIF sets currently making the rounds on Tumblr. Another behind-the-scenes video—which is also a minor spoiler for Thor 2—shows that, before Chris Evans filmed a shape-shifting scene in which Captain America appears, Hiddleston donned the Cap's costume himself. And while there's a technical explanation for why he needed to be in costume at all (which Chris Hemsworth explained back in November), it also seems likely Hiddleston was just too excited to pass up the opportunity. The DVD will be released on February 24, by which point Hiddleston will no doubt have done 10 or 12 other adorable things.